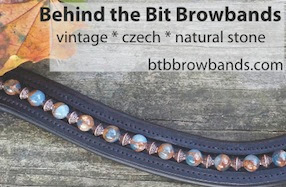 Behind the Bit: More Arab crosses! Maybe it's just because I'm not an Arab fan, but my first thought when I popped over to BTB today was, OMG WTF is that needle-nosed THING!? I know Arabians have an illustrious history of improving many breeds, but if you're going to give me a hot horse I'll take a Thoroughbred over an Arab any day. So, in your opinion what are these Arabian crosses adding to the dressage arena? Beauty is in the eye of the beholder, as always. I think he's just exquisite. I don't know your background, so don't be offended if I underestimate your experience evaluating babies. I'm a newbie myself. 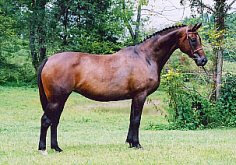 But back in 2006 I looked at a Liberty Gold baby hanoverian -- 3 weeks old -- with a super-dishy and delicate face, and it seemed too feminine to me. I saw him again as a yearling, and it had all softened to a refined but very handsome head. Thanks for answering my question. I've been out of the dressage world for a while, and was interested in your perspective. I've met several successful lower-level Arabs/Arab-crosses, but never seen one competing at higher levels. Do they and can they? Crossbreeding "sporthorses" is popular right now, but it seems like a lot of those prospects are coming to nothing...they're just more unregistrable grade mutts when it comes down to it. That said, please don't think I'm insulting Ancient Oaks - it's clear from their website that they are breeding very nice, proven, inspected stock. It's more the backyard breeders crossing Arabs with Friesians and expecting to make 20k a pop that I object to. Yep, I agree there is a lot of irresponsible breeding going on and I cringe when I see inexperienced mare owners crossing the most unlikely animals! There truly ARE wonderful examples of Arabs in the upper levels. A woman I know/boarded with trained her modestly bred arab to Grand Prix. The bond they had, and the intelligence and work ethic of the animal, was amazing. He was also beautiful to watch, even though to look at him you would not have thought "grand prix prospect." It's great to see that. It's certainly nice to know that horses other than Warmbloods can have so much talent and achieve amazing things in the dressage arena. The first thing I thought was: how far can we go in breeding these horses away from their original ancestry? This looks misformed to me... I have photographs of my grandfather on Arabians when they used to import Arabians from the Bedoeins themselves and resell them. These horses look like strong elegant horses, not at all like the malformations created here by inbreeding. One of them, "Blanca" even went into the army in WW1 with him. My great grandfather lived with the Bedoeins and their horses for 10 years. I think he would be appalled if he saw a 'modern' Arab today. Can't both be beautiful? I also love the old style collies, morgans, and arabs.